Ill-Fainted Aid of Presidential Aid, 1910. 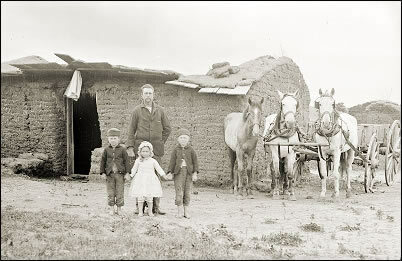 This stalwart homesteader and his three children standing proudly in front of their "Soddie" on the Nebraska plains have had a tough time of it. The photographer's notes tell us that the roof of their home collapsed just hours before his arrival. Heavy rains during the night had soaked the sod, its increased weight snapping the pole supporting the roof. The photographer also tells us that the man’s name is George Barnes and that his wife had died the previous year leaving him in charge of his three young children. A close look at the photo reveals the ill-fitting coats and pants of the two brothers. Obviously their father has not been able to sew or buy any new clothes for his rapidly growing sons. All the children are shoeless. In spite of these troubles, the father has reached into his limited finances and hired the services of an itinerate photographer. He probably can't easily reschedule the session, so he tells the photographer to snap away despite the overnight catastrophe. The family is posed in front of their damaged home with their prized possessions of three well-fed horses and a wagon proudly on display. The children are probably wearing their best clothes. We can assume that all three are hard-working contributors to the farm’s success. Why did George Barnes decide to have this picture taken? Its fair to speculate that it was not for himself. The photo was not meant to be hung on his living room wall. It probably was intended to be sent back East to family or friends as evidence of the homesteader’s success. There is a look of defiance in his stance as the father stands straight and tall behind his children. He seems to say "we will survive and prosper". Photo Credit: Nebraska State Historical Society. Photo by Solomon Butcher.